On Dr. Mikao Usui's memorial stone it is written: "Mornings and evenings, sit in the Gassho position and repeat these words [the Reiki Ideals] out loud and in your heart." Gassho is used in prayer, in reverence, or as a greeting. For Reiki Practitioners, Gasshocan be is paired with the Reiki Precepts in meditation to open the heart, strengthen one's Reiki connection, and clear and balance the chakras. This meditation can be done standing or sitting and it takes 15-30 minutes. Some refer to the Gassho Meditation as one of the three pillars of Reiki. The other two pillars are Reiji-ho and Chiryo and will be covered in a separately. Begin with your eyes closed and hands in Gassho position. Make sure your fingers are pointed upward with thumbs pressed gently at the heart chakra in the center of the chest. Place your attention on the fingers thta are next to your index fingers. It is not unusual for distractions to occur. Simply allow them to float by as you return focus to your middle fingers. Make sure your fingers remain touching. After a few minutes, recite the Reiki Precepts aloud (for beginners) or to yourself (when you become more comfortable). 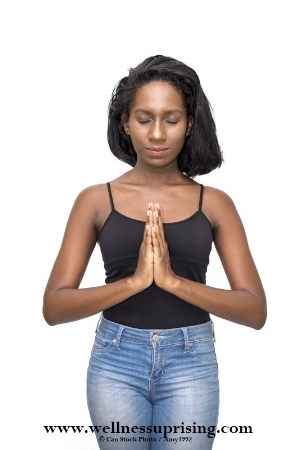 Remain in this meditative pose until your intuition urges you to stop. Take three deep breaths and give thanks to Reiki for this time. Slowly open your eyes.